Every year in April Adirondack Winery throws a big party to celebrate its anniversary, and the fun lasts all weekend! This year, festivities start on Friday, April 12, 2019, and continue through Sunday, April 14, 2019. 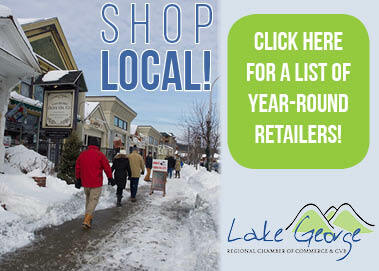 Not only is it a great way for them to thank their most loyal customers and welcome new patrons, it’s also important to the business community as it provides a draw for visitors to Lake George in April. We congratulate them on another successful year and wish them many more! We also love how Adirondack Winery incorporates other local food artisans in their celebration. 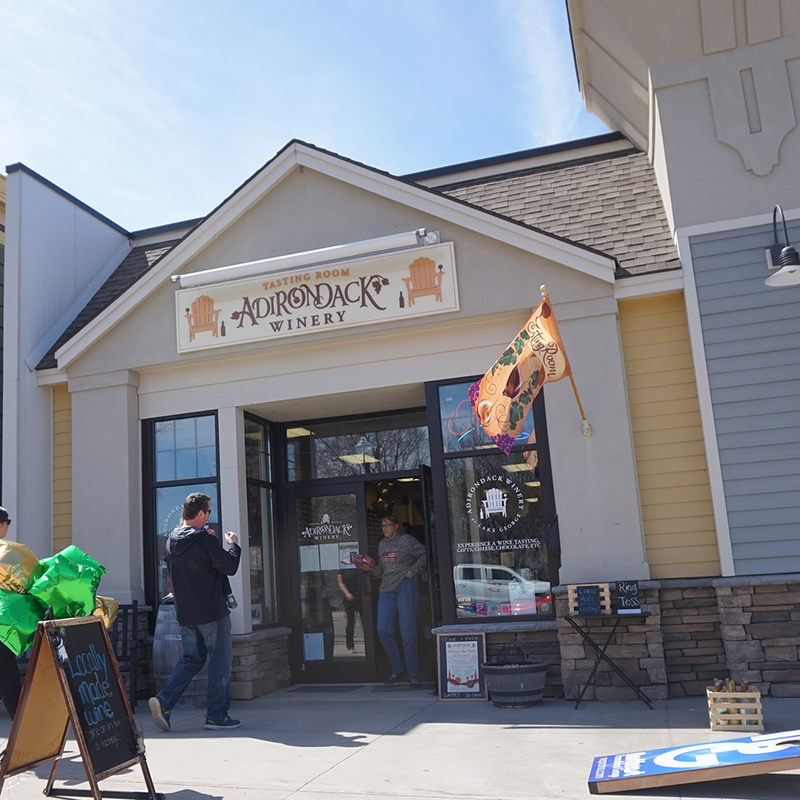 Their business is a great example of local producers working together as you can always taste and buy a variety of locally-made products including food, jewelry and other items in their tasting rooms! This year for the anniversary celebration, they have guest vendors in the Lake George Tasting Room including Eagle Ridge Farms, Barkeater Chocolates and Nettle Meadow Farm. They collaborated with Adirondack Winery to create special wine-infused products for the anniversary! 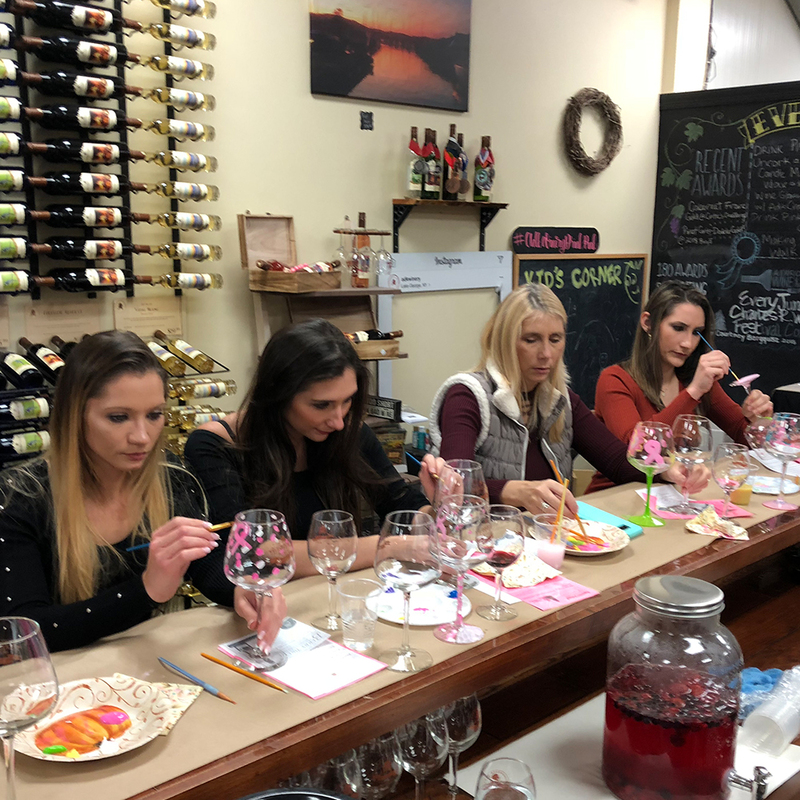 There are so many great events happening between Adirondack Winery’s multiple locations, so read on below to find something to do this weekend! 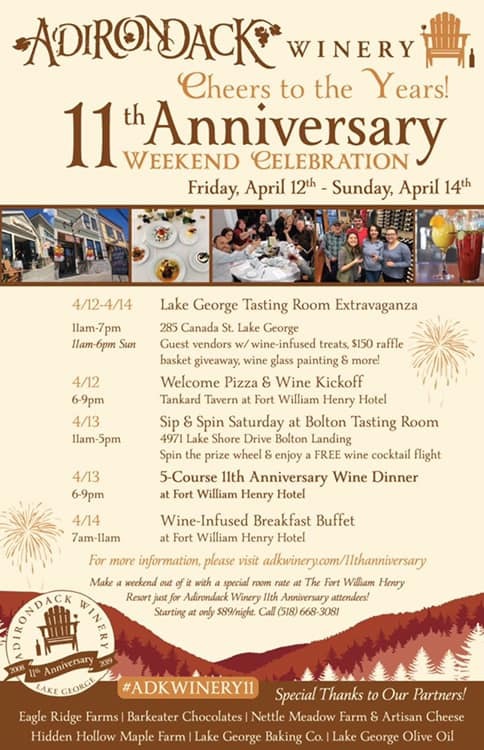 LAKE GEORGE, N.Y. (April 2019): In an effort to thank its most loyal customers and the community it calls home, Adirondack Winery is hosting a series of events this weekend to celebrate its 11th anniversary. 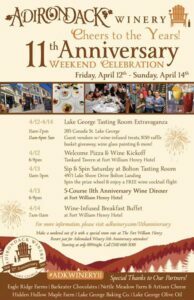 The Winery will welcome hundreds of visitors to its Lake George Tasting Room during its 11th Anniversary Extravaganza Friday, April 12 to Sunday, April 14. 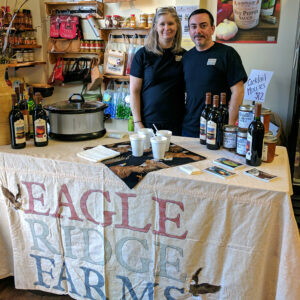 The event will feature guest vendors, including local standouts Eagle Ridge Farms, Barkeater Chocolates and Nettle Meadow Farm, who have teamed up with Adirondack Winery to create special wine-infused products for the Winery’s 11th anniversary. Visitors at the Lake George Tasting Room will also enjoy a special 5-course Ultimate Wine Tasting for 2, featuring all locally made products and 8 wine tastes. There will also be giveaways, paint & sip hours at the bar and more. The Winery’s Bolton Landing location will also open during Anniversary Weekend, drawing visitors to the gorgeous hamlet about 10 miles north of Lake George with a special flight of wine cocktails to every guest who orders a tasting and with the winery’s famous prize wheel, which will be loaded with hundreds of dollars in prizes. In addition to Tasting Room events, the Winery will host its annual Cheers to the Years Wine Dinner at the Fort William Henry Hotel & Conference Center on Saturday, April 13 from 6-9 pm. The 5-course, wine infused dinner features a surf and turf entrée and each dish is paired and prepared with Adirondack Winery wines. With two tasting rooms in Lake George Village and Bolton Landing and a winemaking facility in Queensbury, Adirondack Winery is a family run business built from the ground up by husband and wife team Mike & Sasha Pardy. In 11 years, they have transformed their passion of making wine in the foothills of the Adirondacks to a regionally recognized wine brand that makes the favorite wine of wine drinkers across the Northeast. The winery events are open to the public and reservations are not required for parties of 8 or fewer. Tickets are still available for wine glass painting sessions at the Lake George Tasting Room bar on Saturday, April 13 and April 14, and they can be purchased at adkwinery.com/uncorkcrafthour. Tickets to the 11th Anniversary Wine Dinner are sold out, but the public can get in on the weekend festivities at the Lake George Tasting Room (Friday & Saturday 11am-7pm and Sunday, 11am-6pm), the Bolton Landing Tasting Room (Saturday 11am-5pm) and special events the Fort William Henry Hotel & Conference Center. These include a Pizza & Wine pairing event at the hotel’s Tankard Tavern on Friday, April 12 and a Wine Infused Breakfast Buffet at the Fort on Sunday, April 14. To learn more about Adirondack Winery’s 11th Anniversary celebration, go to adkwinery.com/11thanniversary. Adirondack Winery opened in 2008 as the region’s first winery. Winemaker/ CEO, Michael Pardy, creates the winery’s wide selection of wines, which have won more than 180 medals at competitions to date. Adirondack Winery’s wine labels (created by President Sasha Pardy) serve as a beautiful representation of Lake George and the Adirondacks, featuring artistic photographs of the gorgeous landscapes and landmarks of the region. 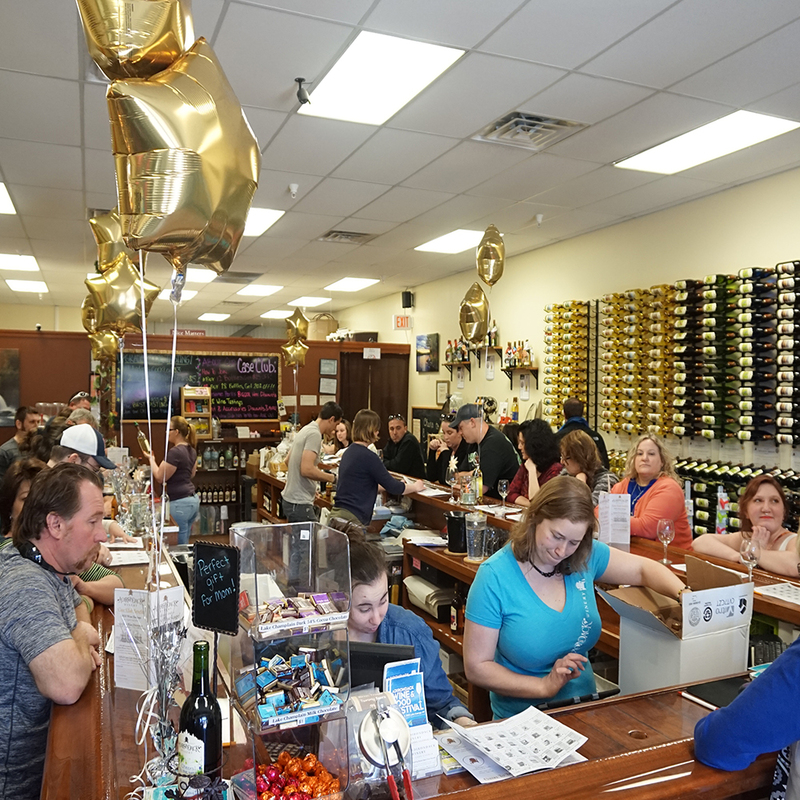 Adirondack Winery’s wine making facility is in Queensbury, N.Y. and its Tasting Rooms are located at 285 Canada Street in Lake George and 4971 Lake Shore Drive in Bolton Landing, NY. Adirondack Winery’s wines are available for sale at its Tasting Rooms and Headquarters; through its online store with shipping to 35 states; at +/- 400 wine stores and restaurants in Upstate New York; and at wine festivals & fairs throughout New York. Adirondack Winery is also the presenter of the Adirondack Wine & Food Festival, held June 23rd & 24th at Charles R. Wood Festival Commons in Lake George.